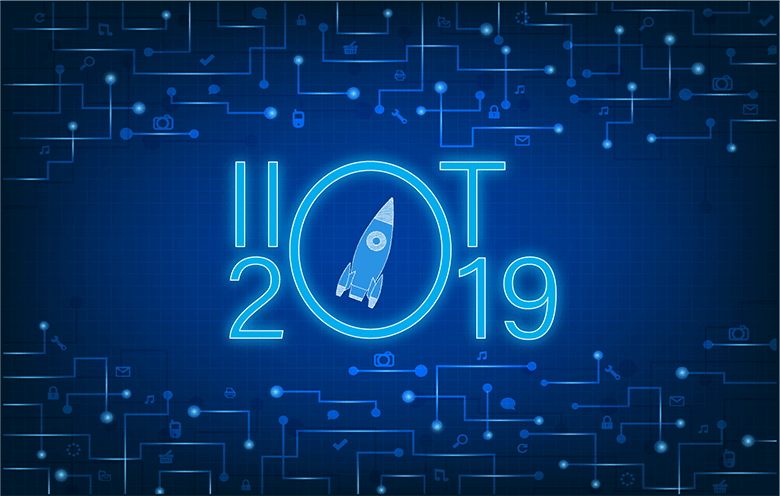 Share the post "How the Industrial IoT will influence businesses in 2019"
The Internet of Things is no longer a pipe dream. In fact, it has become an integral part of many enterprises around the world, especially for those who belong to the industrial sector. IIoT is penetrating all sectors and markets, unlocking new opportunities for both service providers and their customers. As per the recent survey conducted by Softweb Solutions, 75% of respondents feel that IIoT would be a major part of their growth strategy in 2019. Nowhere will IoT be more influential than the industrial sector including engineering and manufacturing, oil & gas, agriculture, construction, energy, and pharmaceutical. This brings up the question – why is IoT so important for companies that belong to the industrial sector? If we look back in time, there is a long transition of how the industry has evolved which is better known as the industrial revolution. During the first industrial revolution, we went from man-made goods to machine-made goods. Next came electricity, which enabled companies to increase the production capacity while taking the potential of their machines to the next level. And now we see how IoT is turning every factory asset into a smart, connected asset. Today, companies are developing and using smart IoT solutions like smart factory and remote asset monitoring solutions to monitor the asset performance, track the location of their machines, and improve shop floor processes. In fact, there is much more; companies are implementing machine learning algorithms to make the most of machine data and optimize manufacturing operations. The first opportunity is to connect machines and read data to get a basic understanding of what is happening. The next is to bring machines to life through smart applications and make more sense out of the data. 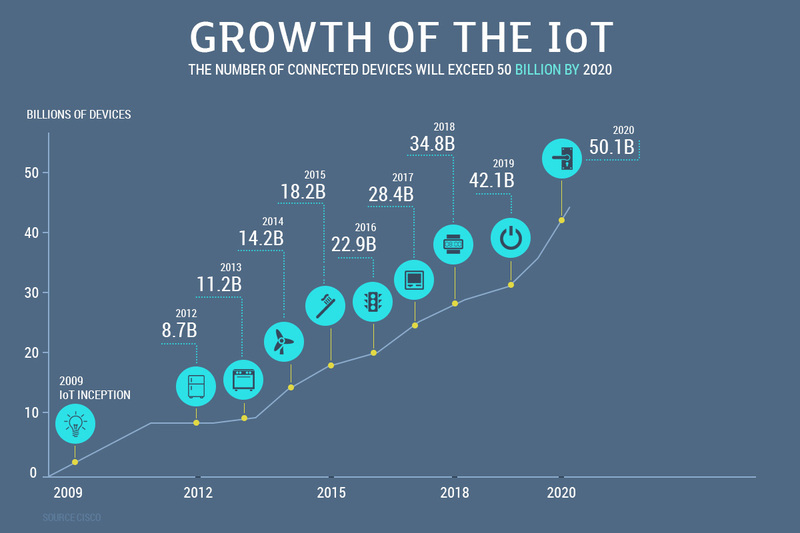 Now let’s look at the growth of IoT over the course of time. 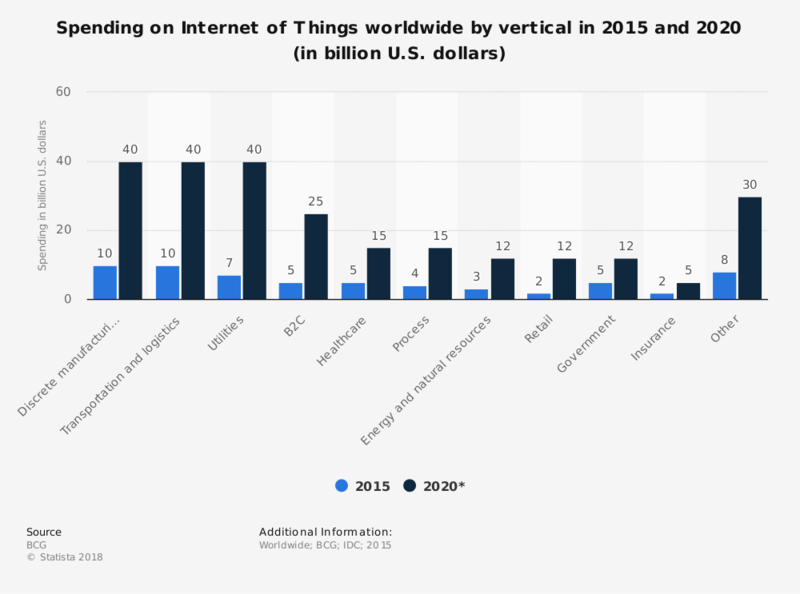 Let’s look at spending on IoT worldwide by vertical. According to research by Business Insider, global manufacturers will invest $70 billion in IoT solutions in 2020. That is remarkably up from $29 billion in 2015. To understand the opportunity better, let’s take an example of Tesla. The company introduced a car (named Model S) in 2012 which was way ahead of its time with a unique large touchscreen featuring integrated system controls. Soon after 3 years, the company introduced a versatile, user-friendly OS followed by some strategic alliances and new hires. The company has worked towards making the most of car data and make car owners more informed about the car performance. Soon the company released a software update and as a result, Tesla could come up with Model S which not only allows a driver to control the common dashboard functions such as lights, windows, and climate but also facilitates the monitoring of energy usage. Currently, the company is actively working to add self-driving capabilities to their cars with an aim to improve the driving experience and increase safety. This may sound overwhelming to you but there is much more to come in the world of Industrial IoT. New, smart microcontrollers will come into the picture which will make IoT more secure than ever before. IoT will not be alone on its journey as world-changing technologies such as AI, blockchain, autonomous robots and augmented reality will be an integral part. Companies will be able to come up with new business models with greater business opportunities. Products will feed data back into the product development process for future improvements, which will enable manufacturers to develop smarter and more reliable products. Companies will use advanced analytics using connected machines and equipment, and use the data to analyze and optimize operational processes. With machine learning algorithms, companies will be able to understand the trend better and make informed decisions (for example, demand forecasting or recommendation engine in productions). Companies will be able to make good use of historical data and avoid unnecessary maintenance costs. Advanced data visualization techniques will bring transparency to the shop floor. Manufacturing firms will be able to increase revenues per employee. A new market for IoT managed services will emerge. So connecting devices and gathering data from them is just the first step. IIoT will be accompanied by the hottest technologies such as AI, AR, and robotics, which will transform certain processes forever. How can your company prepare for the new paradigm shift? So far as IoT is concerned, the technology is still evolving and getting better with every passing day. 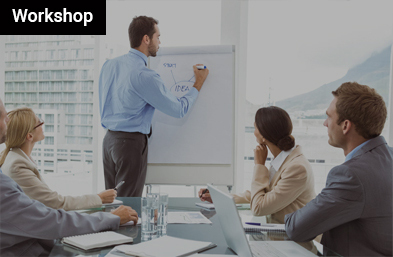 Therefore, it is a constant learning and companies need to figure out how they can get the best learnings. The first obvious step will be to choose an IoT platform and get your devices connected to collect data and then learn from it. You can also hire IoT consultants and experts since there is a lot of programming work and technical know-how involved in adopting IoT to make it thrive for you. New opportunities are coming thick and fast and companies are preparing themselves to embrace new IoT initiatives, are you?